Figuring out what the costs for your boat insurance is going to be is not easy to do without contacting a boat insurance company. There are different factors which are considered when a company is figuring a quote, so really, there are no tricks to it. But, there may be things you can do that will help lower your premiums. For instance, most insurance companies will give a discount for those boaters who successfully complete an approved boating safety course. These are the courses that are approved by the National Association of State Boating Law Administrators (NASBLA), and courses by the Coast Guard Auxiliary, Power Squadron and others. Costs are also determined by the area you will be boating. Areas that are prone to hurricanes, coastal regions compared to inland, will usually have a higher premium and deductibles. When figuring the cost for a premium, the boat insurance company will take into consideration the operators driving record, experience as an operator, and what kind of boat it is. The operator with a good driving record may have better premiums than that of someone who is on first name basis with the Traffic Court Judge in town. Your driving record may very well have an impact on the cost of your boat insurance. 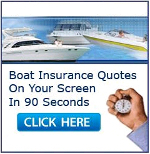 The amount of experience one has compared to the type of boat being insured will have an impact as well. If the first boat you ever buy is a Baja 35′ Outlaw, your premiums and deductibles will probably be high. So, be sure to stay within your comfort range, stay with the size you have operated before; grow in to that 35 footer. Most older boats and high performance boats (speed boats) will have higher premiums and deductibles as will gasoline powered boats be higher than the diesel vessels. One can also lower their deductibles by the hull deductible that is picked. The hull deductible is the amount the boat owner will pay in the event of a loss to the hull, machinery, or equipment. . There are those companies that have flat deductible rates – $250, $500, $750, or $1000; while other companies charge a percentage of the boat value, usually 1% or $250 minimum. Boat insurance companies may also allow a discounted premium if the boat owner agrees to a higher deductible. The amount varies and depends on the percentage rate and boat value as well. Oh, and the obvious – the fewer the claims you file, the better the insurance premiums. So, complete a boating safety course, learn all you can to keep your family, friends, you and your boat safe while keeping your boat insurance costs down.